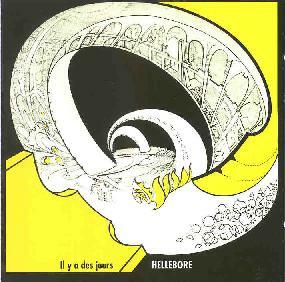 Hellebore - "Il y a Des Jours"
Firmly in the RIO tradition, Hellebore is a French band whose music is most often reminiscent of Etron Fou Leloublon, but is equally influenced by the darker classical realms explored by Univers Zero. The band consisted of Jean Cael on bass, crumar, and vocals, Alain Casari on saxophone, clarinet, flute, and vocals, Antoine Gindt on guitar and crumar, Daniel Koskowitz on drums, percussion, and vocals, and Denis Tagu on piano, organ, guitar, and vocals. Originally released in 1985, the Gazul reissue includes three bonus tracks that had appeared on earlier compilations and tapes. The guitar is a prominent but secondary instrument, it's lead lines in no way standing out but rather helping to keep the controlled flow of the music in the same way that the bass and percussion does. From the first track, "Introduction Végétarienne", Hellebore states their RIO influences with a relatively simple whose piece with horns, organ, and rhythms that quickly brings to mind the darker and less whimsical side of Etron Fou. "Tetraktys" and "Artefact" are similar tunes, though "Artefact" stood out with its thundering bass and percussion that function as an ensemble seemingly separate from the rest of the band. Things start to get more exciting with "Film di Ripratoria", an intense track that is far more experimental in its use of sound collages than the previous tracks, while also rocking out more in segments. It reminded me of some of the music from Present's first albums, though with expanded instrumentation. "Warme Wasser mit Grass" is another more aggressive rock-oriented tune, similar to Fred Frith's Gravity or Speechless albums. Like "Film di Ripratoria", "Umanak - Marquis de Saint Cricq" is a more experimental track but is also more freeform in its playing. A sense of controlled chaos is ever-present as the music segues through various manic and more slow-paced segments, creating atmospheres of ambient spaciness, anger, and whimsy, and does a reasonably good job of maintaining a smooth flow throughout. The avant-classical influences are prominent and stated most eloquently on this 14 minute track. The only thing that disappointed me about the bonus tracks was that "Les Lions" and "Gargamel Chez les Cosaques" ended just as they were proving to be among the best tunes on the CD. On "Les Lions" the guitars are far more up-front than on the regular album tracks, and there's some wild sounds that I first I thought were bubbling synths, but are probably bass. Lots of well done thrashing and bashing about. It develops into a bit of a King Crimson jam but ends just when it starts to take off. Bummer. "Gargamel Chez les Cosaques" is a totally whimsical Etron Fou type tune with cool freaky sax and synths. But it ends very abruptly after less than two minutes. Another track that deserved further development. An internet search turned up little information on Hellebore and I believe this was their only full-length release. There's little that's unique about Hellebore's sound as the continual comparisons in this review attest. Still, the music is solid and is a must for any fans of the RIO world and avant-progressive music in general.